The Techline T3 is an economically priced HVLP gravity feed gun for use with a range of coatings from primers to top coats to stains. The T3 combines C.A.T. 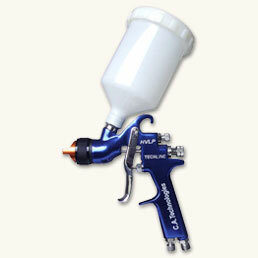 fine finish nozzles on a low-cost gun body so you can achieve the best of both worlds - economy and fine finish. Features include air adjusting valve and 750cc plastic cup. This gun complies with all environmental regulations for HVLP.